Your OEM Top-Mount Intercooler does just fine at stock boost under normal use, but as soon as you start putting some real heat into it with higher boost or harder use, it heat-soaks beyond recovery. The GrimmSpeed Top-Mount Intercooler is the perfect solution. So, you probably already know that you want an intercooler with maximum cooling and minimum restriction, but when it comes to selecting the right ‘man for the job’, we think it’s important to understand why. As air is pressurized by your turbo, it heats up, not because of the heat of the turbocharger, but because when they’re compressed, the atoms in the air are forced closer together and as a result, move faster and have more energy. That energy manifests itself as heat. The more heat we can remove from the system, the denser the air becomes and that’s what helps eliminate pre-detonation, or ‘knock’, allowing for increased output from your system. 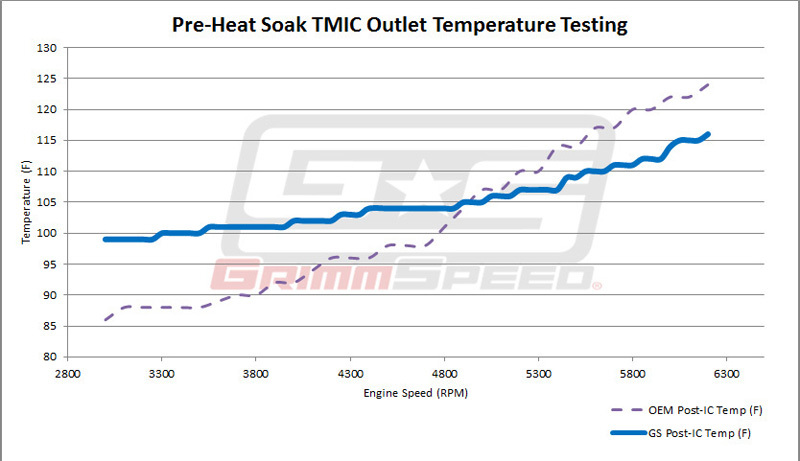 Your OEM TMIC does just fine at stock boost under normal use, but as soon as you start putting some real heat into it with higher boost or harder use, it heat-soaks beyond recovery. There are two primary considerations in the design of an intercooler: maximum heat transfer and minimum pressure drop. Unfortunately, one causes the other, so finding a perfect balance requires a detailed understanding of the intended application, some serious engineering power and the highest quality manufacturing processes. Fitment and quality are also critically important to ensure that the most safety-critical part of your turbo system is up to the task every time your foot hits the floor. We began by laser scanning an OEM TMIC to plot the mounting points and space claim in CAD with pinpoint accuracy. At the same time, we designed a custom bar and plate core with overall dimensions, fin density and fin types that would provide the insane heat transfer area we require with minimal flow restriction. With core size nailed down, we got to work designing end tanks that offered smooth flow, perfect fitment and even distribution of the hot charge air through the core. Countless revisions were tested in flow simulation before we finally found exactly the characteristics that we wanted. From there, 3D printed prototypes were used to confirm fitment and we began work on manufacturing details in preparation for verification testing and production. The core of any top mount intercooler is the beating heart of the beast. The intercooler cools your hot charge air in two different ways. The first is by reducing temperature by transferring heat from your hot, compressed air by conduction through the fins of the intercooler. The second is from a small pressure drop due to the flow restriction in the fins. The idea when you’re selecting an intercooler is to find one that results in an overall increase in air density. Rather than designing the largest possible core, or the core with the highest possible fin density, we created a well-rounded unit that’s designed specifically for Subaru’s making up to 550whp. That said, this particular core flows over 1500CFM and will support up to 575whp before it’s likely that a FMIC might be better suited for your system. In our pursuit of perfection (there’s that p-word again), we learned a great deal about aluminum casting. If you’ve done similar research, you know that every aftermarket end tank that you’ve handled was cast from a one-time-use mold made of re-used sand. Not our style. In typical GrimmSpeed fashion, we stepped outside of the box and explored other options. We quickly learned that we had stepped into big boy territory. I’ll let the photos do most of the talking, but here’s the scoop. To achieve the quality, tight tolerances, pressure tightness and strength that we required, permanent mold casting became our only option. Each and every end tank is cast from the same CNC machined mold, ensuring not just dimensionally perfect castings with an amazing surface finish, but also excellent repeatability. With this method, we have perfect control over both the internal and external contours of each casting. After casting, every single mating surface is precision machined for a leak-free finish and unbeatable fitment. We will not be outdone. We designed tabs to be laser cut and CNC bent from 5052 aluminum, selected for its ductile nature, to ensure that the bending and welding processes don’t compromise their integrity. These will accept your stock TMIC bushings and offer plenty of adjustability for tweaked brackets and ‘creative’ turbo setups. After each component has been inspected, our welder, Josh, hand TIGs each and every assembly. From there, each assembly is pressure tested to 50psi and is thoroughly cleaned before it’s sealed up and prepared for shipping. Performance is a difficult subject when discussing a top mount intercooler that can be used in many different systems, often times with different goals. For that reason, we’ve opted to use primarily stock-turbo cars running higher boost. This particular 2.0l TD04 car is running full exhaust (catted), a GrimmSpeed EBCS and a 19psi tune. First, we tested pressure drop to ensure that our aggressive core design didn’t negate its benefits with a massive pressure drop. The graph below shows boost pressure in the inlet and outlet end tanks, as well as the calculated pressure drop and a trendline. Because of sampling rates and the nature of the pulsing system, you’ll notice that there is a great deal of noise in the pressure drop measurements. What’s important is the trend and as you can see, the maximum recorded pressure drop is just above .2psi with an average of around .1psi. 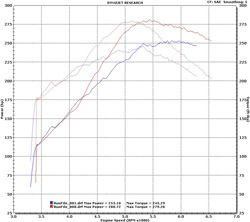 Data was collected using a DATAQ DI-148U sampling a pair of ProSense pressure transmitters at 240Hz. Next, we tested inlet and outlet temperatures using a pair of K-type thermocouples and high frequency multimeters. What we found is that with a stock turbo, the OEM WRX TMIC seemed to keep up OK until 5000rpm or so. At that point, the efficiency of the OEM TMIC drops off very quickly. As we continued doing pulls, performance of the OEM TMIC degraded very quickly and the GrimmSpeed TMIC refused to budge, no matter how much heat we put into it. 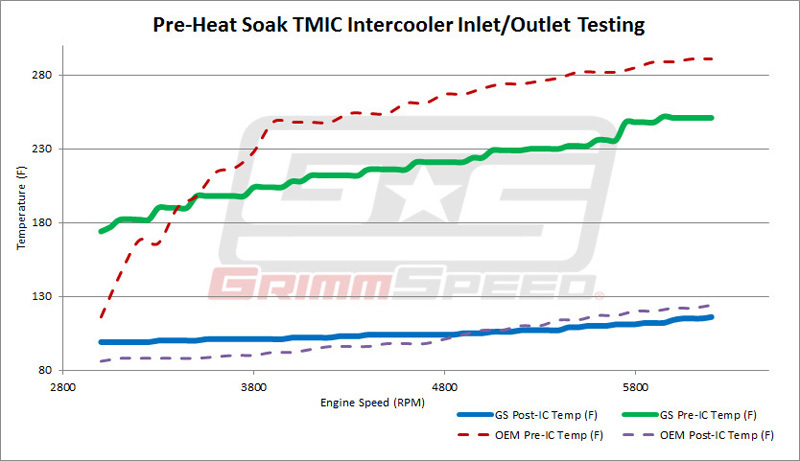 The graph below shows the post-IC temperatures for the GrimmSpeed TMIC vs. OEM TMIC. Note that these pulls were both completed after the same warm-up procedure (a series of shorter pulls) but before the OEM TMIC was fully heat soaked (and just about useless). Lastly, the third graph shows the calculated efficiency for these two top mounts based on temperatures taken from the same two pulls. 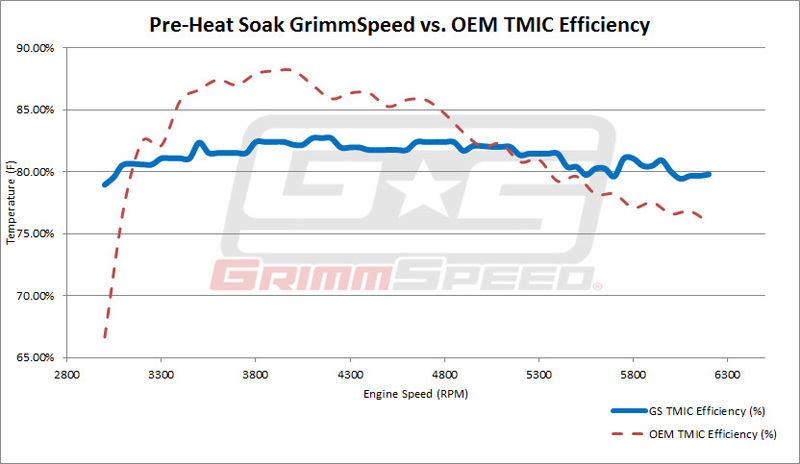 This graph shows that even before it’s heat-soaked, efficiency of the OEM TMIC begins to drop significantly after 3800rpm. Of course, power figures vary from dyno to dyno, and actual power gains will vary from setup to setup. 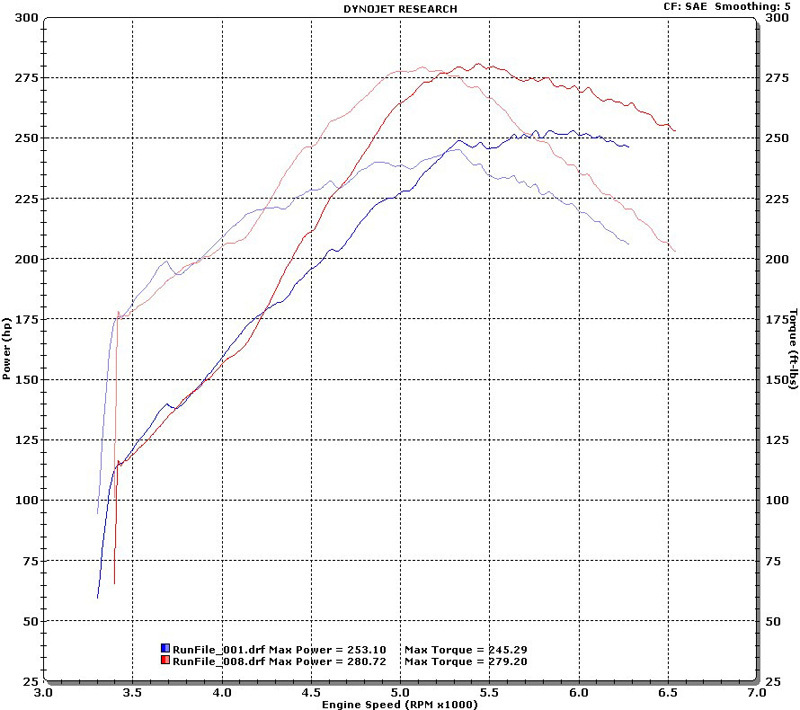 What's shown below are the actual before and after power curves for a Forester XT running a vf39 on an auto trans. After the first pull, the car was tuned for the GrimmSpeed TMIC, to take advantage of the additional cooling and much lower pressure drop. At 5000rpm, the car picked up an additional 35whp and 37ftlb. Because of our dedication to providing an excellent, well-rounded product, you’ll find that with the proper y-pipe, the GrimmSpeed TMIC will install with ease. We designed the TMIC to work with your stock STI y-pipe. Don’t have one? No problem. We’ve also designed a cast aluminum y-pipe kit with a 4-piece 5-ply silicone couplers and t-bolt clamps for each and every connection (not included). Worried that your hood scoop splitter might not feed your GrimmSpeed TMIC with the air it needs to properly keep those outlet temps low? We thought you might, so we’ve also designed a lightweight splitter that’s optimized for our TMIC as well as whatever scoop you might have. Check out the TMIC Splitter Product Page to learn more about the five fitments and how even STI owners will benefit from the upgrade. An intercooler functions by forcing the ambient air coming into your hoodscoop through the core, where it interfaces with the hot charge air and carries heat out the bottom. If your splitter doesn't seal perfectly, ambient air is likely to take the path of least resistance and slip around the TMIC. We've found noticeable performance improvement when using a correctly-fitting TMIC Splitter compared to an incorrectly fitting splitter. We has designed and manufactured a wide range of splitters so that no matter your application, you have a custom splitter that will extract maximum performance from the GrimmSpeed Top Mount Intercooler. Follow this link to learn more and be sure to use the correct splitter for your vehicle and hood scoop.